The modular crushing and screening plant is consisting of one or several crushing or screening units based on the customers’needs of the projects. 1. 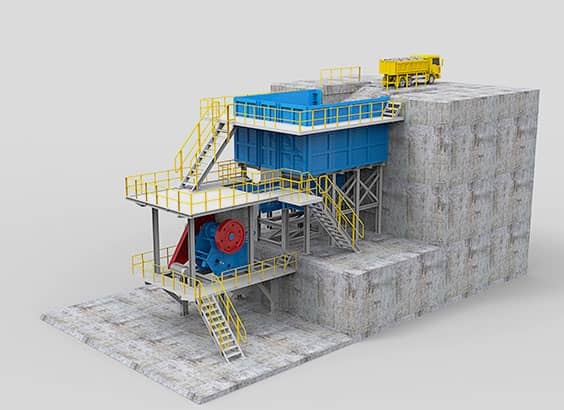 The jaw crusher modular crushing plant is mainly used for mineral and rock primary crushing processing. 2. The different specifications of the feeders, jaw crushers, belt conveyors and module structures are designed according to different production capacity. 3. The matched feed bin is designed according to different feeding types, which is easy to be fed by excavator or dump truck. 4. According to customers’ needs, configuring with the crushing hammer is used for the oversize materials processing to improve the efficiency of jaw crusher. 5. Configuration with the one or two-level grizzly vibrating feeder is under the raw materials bin, which can do the pre-screening and cleaning work for the raw material. 6. The skid structure platform of equipment base with walkways, handrails and ladders shall be designed, which is more convenient to observing, inspection and maintenance. Main steel structures Feed bin unit, Support base, Maintenance platform, Ladder and railings, Feed chute and discharge chute.